Stephen O’Donnell on his decision to retire and how he transformed his flailing career at Dundalk. Stephen O'Donnell won four league titles with Dundalk. EVEN DURING SEMINAL moments, Stephen O’Donnell is not one to get too carried away. There is not a hint of hyperbole or sentimentality, as the 32-year-old recalls a life immersed in football. The Galway native this week announced his retirement from playing, with countless tributes offered in response to this news. Having won six league titles and three FAI Cups, most notably serving as a linchpin and leader of the Dundalk side that has come to dominate the League of Ireland’s Premier Division with such impressive consistency in recent times, seasoned watchers of the domestic game would agree that O’Donnell deserves to be regarded as one of the best players of his era. Yet the departing midfielder, when faced with the choice of self-promotion or self-deprecation, will naturally always gravitate towards the latter. “It’s been hectic enough,” he tells The42, in relation to the past few days in which news of his retirement made national headlines. That is not to suggest, however, that he is not proud of what he achieved. The experienced star has no regrets about how everything panned out, and feels that with his 33rd birthday just days away, the time is right to bow out. I’m happy with my decision — that’s the main thing,” he says. O’Donnell is no stranger to serious injury, having at several points during his career been forced to embrace the gruelling work required to recover from leg breaks and other severe setbacks. “It’s tough and when it happens repeatedly, it can chip away at you,” he admits. In the end, though his body ached with increasing regularity, he was not forced into retirement. 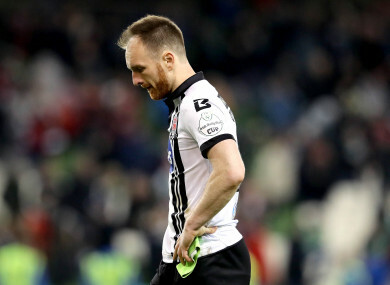 After suffering a leg break last May against Waterford, he had got himself back fit to start the final game of the league season against Bohemians, though a much-coveted place in the matchday squad for Dundalk’s subsequent FAI Cup final encounter with Cork eluded him. “Sportspeople say ‘when you know, you know,’ and I think over the off-season, I knew it was time,” he explains. The wear and tear from past injuries were ultimately just one of a combination of factors that prompted the big decision. Stephen Kenny’s departure to become Ireland U21 boss saw changes in the backroom staff. Last season’s assistant manager Vinny Perth became the main man, while ex-Dundalk player Ruaidhrí Higgins was appointed as the new number two. Consequently, Higgins’ previous role as senior opposition analyst was vacant and O’Donnell jumped at the chance when this new opportunity presented itself. Eventually, he hopes to become a manager in his own right, but “baby steps,” such as the completion of the Uefa A Licence Course, must be navigated first. There were also doubts in O’Donnell’s mind as to whether he could continue to reach the lofty heights himself and others at the club had hit in previous seasons. Being captain of the top team in Ireland is no mean feat, and can take its toll emotionally and physically. Now, he believes, it is time to sit back and allow other younger players the chance to emulate and possibly even surpass his own achievements. Irrespective of the departure of O’Donnell and the similarly seismic loss of Kenny, the ex-player is confident the club is in good hands. There is a “great dressing room” that should facilitate a smooth transition in the forthcoming months. The majority of the backroom staff are still in place, albeit in different positions, and O’Donnell feels that this degree of continuity will help the Lilywhites remain the side to beat in the Premier Division for the foreseeable future. It is O’Donnell’s past, however, that informs his present pragmatic mindset. Despite growing up in Galway amid a background in which GAA was the dominant sport, O’Donnell’s talent for soccer was starkly apparent early on. There were high hopes locally for what he could go on to achieve, and after impressing in the Kennedy Cup, widely regarded as one of the pre-eminent schoolboy competitions in Ireland, it was not long before Arsenal came in with an offer the youngster felt compelled to accept. Back then, the Irish footballing landscape was immeasurably different to its current incarnation, and the switch to North London meant O’Donnell’s education suffered and his Leaving Cert was by-passed. The decision was understandable — most people would find it immensely difficult to act differently in similar circumstances, even if hindsight would render O’Donnell’s choice somewhat ill-advised. 15 years on, the temptation for teenage footballers to stay in Ireland is stronger. The introduction of U13, U15, U17 and U19 leagues mean proper pathways now exist for domestic-based players to progress to senior level, without necessarily having to rely upon an early move across the water to ensure steady development. There were, of course, also plenty of positives to the Arsenal move. With an insistence on playing attractive football at the club, it was there that O’Donnell honed the considerable technical qualities that would serve him so well in Irish football. O’Donnell’s two-year stint in England coincided with what is arguably the most memorable period in Arsenal’s history — ‘The Invincibles’ 2003-04 season, where the team won the Premier League while going the entire campaign unbeaten. Although he never played a first-team match, there were times where O’Donnell trained with legends of the game, such as Thierry Henry, Denis Bergkamp, Patrick Vieira and Robert Pires. While enjoying his time at the Gunners, O’Donnell is honest enough to admit that he failed to meet the criteria required at such an elite level. A certain immaturity hindered him and meant he wasn’t always eating right and looking after his body in the appropriate manner. Frustrated by the lack of first-team opportunities at the Premier League club, he joined Scottish side Falkirk in 2005, spending two years there and making over 50 appearances, pitting his wits against sides of the calibre of Celtic and Rangers among others. Yet it was not long before O’Donnell grew restless again. He was playing on the left side of a midfield diamond and felt this position was not the best use of his talents. While the League of Ireland has become more respected and stable in the intervening years, a return to his native shores at the time felt like a last resort for the disillusioned star. Being honest, it was something I probably just had to do. I was meant to go to Bournemouth and that sort of fell through. The weeks were ticking along and the League of Ireland was halfway through when I needed to start getting an income in and getting a club, so Bohs got in contact. I signed for them and that was pretty much it. In a foreshadowing of the success to come, O’Donnell began life back in Ireland brilliantly, helping Bohs to a league and cup double in his first full season at the club. Nevertheless, his early experiences of domestic football were characterised primarily by turbulence — in 2013, Dundalk became his fifth club in six-and-a-half seasons. After Bohs, a short spell at Cork was marred both by a knee injury and the club’s financial perils, which prompted an inevitable sense of chaos and disharmony at Turner’s Cross during that problematic 12-month period. Subsequently, O’Donnell spent a season at Galway, before moving on to Shamrock Rovers, who were enjoying the best spell of their recent history with the soon-to-be Northern Ireland boss Michael O’Neill in charge. O’Donnell was part of some memorable occasions with the Hoops. He helped them secure the league title in 2011, the second year on the bounce they had achieved this feat, having previously ended a 16-year wait to lift the title. The Galwegian was also an important member of the squad’s historic European run, scoring the winning penalty against Partizan Belgrade and helping Rovers become the first Irish side to reach the Europa League group stages in the process. However, notwithstanding these brilliant moments, O’Donnell’s short-lived spell at Tallaght was far from idyllic. Others had previously questioned his fitness, but for a manager with the knowledge and renown of Michael O’Neill to do so should have set alarm bells ringing. But it was only after the midfielder left Rovers that the penny finally dropped. To his surprise, the phone was not ringing relentlessly after his Hoops exit. He was therefore underwhelmed by a sole offer from Mervue United, a First Division club back then. O’Donnell was even considering undertaking a FÁS course, when Stephen Kenny rang out of the blue with a proposition that he ultimately accepted. At the time, it seemed only a marginally more attractive offer to the Mervue one — he would be joining a Dundalk team that had last tasted league glory in 1995 and the previous year only narrowly avoided relegation by beating Waterford in a play-off. However, it proved a turning point in O’Donnell’s career. Like so many of the club’s unheralded coterie of players, he was revitalised under Stephen Kenny and the team were almost instantaneously transformed from relegation battlers to title contenders. In the first season, the Lilywhites missed out on the title to St Pat’s by three points, but would go on to finish top in four of the next five campaigns. Looking back now, I wasn’t giving myself the best opportunity physicality-wise, I wasn’t in the best shape. I wasn’t dedicating my life to football, whereas if you want to be successful, you’ve got to dedicate your life. I probably only started doing that when I came to Dundalk. A lot of other lads did too and they could see the benefits of it. The Kenny effect was substantial and O’Donnell’s cites the future Ireland manager’s positivity as his biggest asset. As he considers his career over the next few days, O’Donnell can reflect with a great deal of satisfaction. Not many Irish players get to captain a youth team that includes Cesc Fabregas, or play against a legend like Roy Keane, or score a goal on the final day of the season to help win the league against your main title rivals, or participate in numerous memorable nights on the European stage. He may have taken a while to get there, but O’Donnell ultimately became one of the most formidable players to have graced the Irish game, dominating midfields continually and playing a pivotal role in inspiring a domestic dynasty. Email “'Looking back now, I wasn't giving myself the best opportunity... I wasn't in the best shape'”. Feedback on “'Looking back now, I wasn't giving myself the best opportunity... I wasn't in the best shape'”.